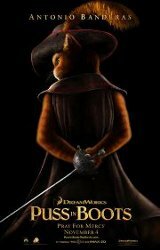 Puss in Boots from the Shrek series gets his own starring role. Placed as a prequel way before he hooked up with Shrek, we follow the young Puss and his best friend growing up in an orphanage. They dream of finding some magic beans which will allow them to climb into the giant's castle in the clouds to steal the goose that lays the golden egg.